Lough Shark (Acton Lake) is a specimen bream water with bream up to and in excess of 8 pounds. It is also home to large hybrids of Rudd and Bream and has got record sizes within its midst with the occasional Tench also making an appearance. 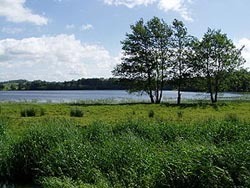 This Lake, which is easily accessible by road, offers good Pike fishing. Long range feeder tactics work well for specimen bream and hybrids. Boat fishing is by special arrangement only. Fishing is free, and there is good access from the road but you need to seek the landowners permission. From Banbridge take the B10 road to Scarva and turn left into Scarva village. Turn right in the middle of the village (signposted Tandragee). At the end of the road, turn left. Acton Lake is approximately 2.5km along the road on the left.